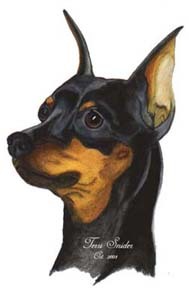 Not only do Miniature Pinschers bless my home and family they come to life on my art pads. 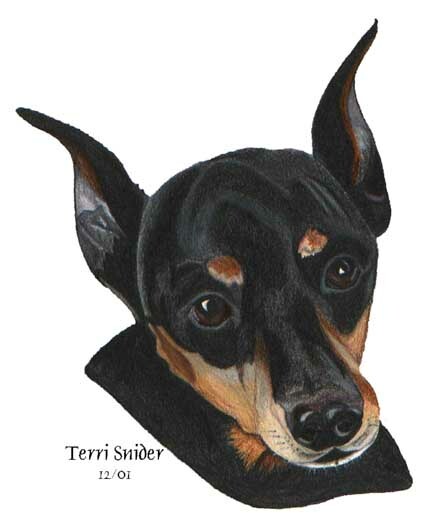 Although I have been commissioned in the past to create portraits of family pets, all of which I enjoyed dearly creating, the Miniature Pinschers that I put to paper are by far my favorites. 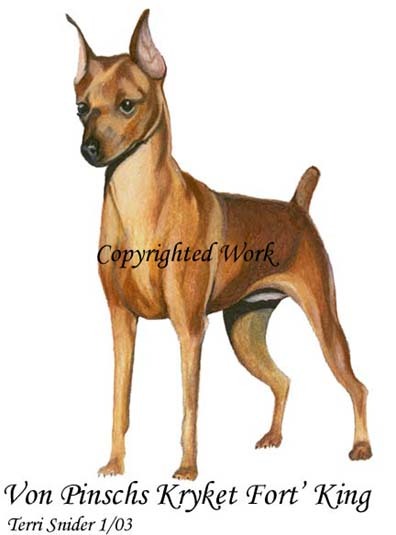 My newest portrait is of my own boy, R Anubis Desert Stryder, "Stryder" I completed this portrait in Nov. 2003 and is now framed and over-looking my living room. 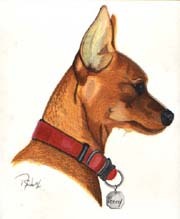 In 2002 I listened to many Miniature Pinscher enthusiast claim that finding our breed in art and prints is hard to do. 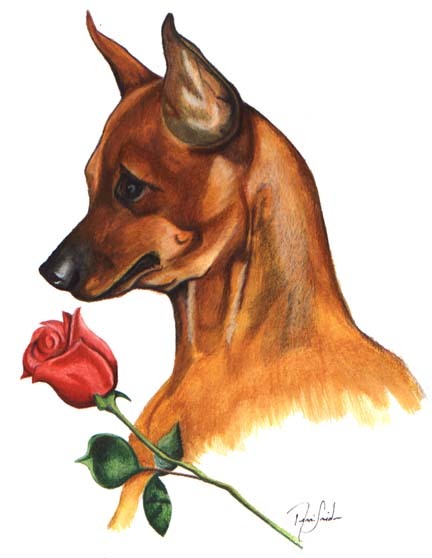 Taking that to hand I created the first of a series of Miniature Pinscher prints. 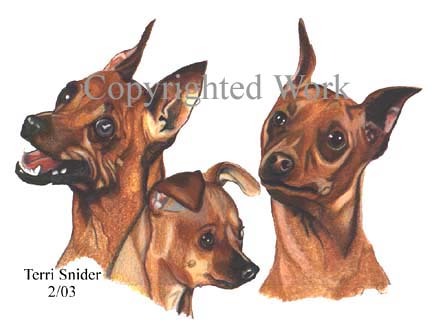 I sat out to find models for what would be the first ever collection of Miniature Pinscher prints. 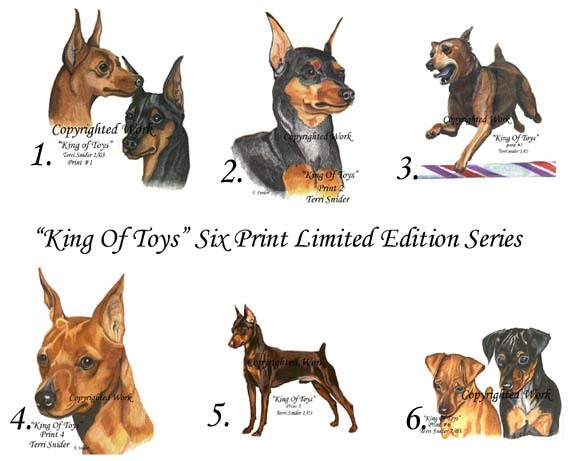 Each Miniature Pinscher represented in my print collection was done in different styles to interest different art collectors. 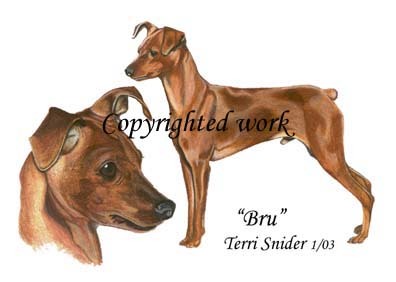 From a fun "Cartoon" style in print 1, to life like eye moving detail in print 4 each print represents our breed at it's best. 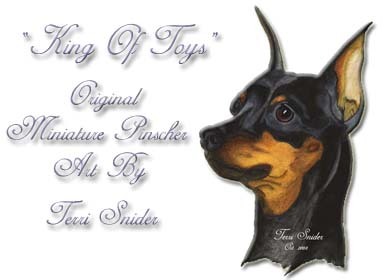 While working on my "King of Toys" print collection I also filled many Commission orders for Min Pin owners. Below is a small sample of some of my favorite portraits. 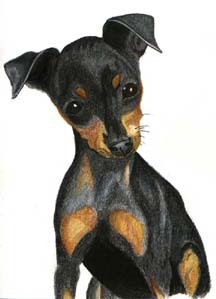 The portrait below came straight from my heart for a very special friend. Kryket will live in our hearts forever.